This article is about the dwarf planet. For the asteroid, see 433 Eros. For other uses, see Eris. Eris (minor-planet designation 136199 Eris) is the most massive and second-largest (by volume) dwarf planet (and plutoid) known in the Solar System. Eris was discovered in January 2005 by a Palomar Observatory-based team led by Mike Brown, and its discovery was verified later that year. In September 2006 it was named after Eris, the Greek goddess of strife and discord. Eris is the ninth most massive object directly orbiting the Sun, and the 16th most massive overall, because seven moons are more massive than all known dwarf planets. It is also the largest which has not yet been visited by a spacecraft. Eris was measured to be 2,326 ± 12 kilometers (1,445.3 ± 7.5 mi) in diameter. Eris's mass is about 0.27% of the Earth mass, about 27% more than dwarf planet Pluto, although Pluto is slightly larger by volume. Eris is a trans-Neptunian object (TNO) and a member of a high-eccentricity population known as the scattered disk. It has one known moon, Dysnomia. As of February 2016[update], its distance from the Sun was 96.3 astronomical units (1.441×1010 km; 8.95×109 mi), roughly three times that of Pluto. With the exception of some long-period comets, until 2018 VG18 was discovered on December 17, 2018, Eris and Dysnomia were the most distant known natural objects in the Solar System. Because Eris appeared to be larger than Pluto, NASA initially described it as the Solar System's tenth planet. This, along with the prospect of other objects of similar size being discovered in the future, motivated the International Astronomical Union (IAU) to define the term planet for the first time. Under the IAU definition approved on August 24, 2006, Eris is a "dwarf planet", along with objects such as Pluto, Ceres, Haumea and Makemake, thereby reducing the number of known planets in the Solar System to eight, the same as before Pluto's discovery in 1930. Observations of a stellar occultation by Eris in 2010 showed that its diameter was 2,326 ± 12 kilometers (1,445.3 ± 7.5 mi), very slightly less than Pluto, which was measured by New Horizons as 2,372 ± 4 kilometers (1,473.9 ± 2.5 mi) in July 2015. Animation showing the movement of Eris on the images used to discover it. Eris is indicated by the arrow. The three frames were taken over a period of three hours. Eris was discovered by the team of Mike Brown, Chad Trujillo, and David Rabinowitz on January 5, 2005, from images taken on October 21, 2003. The discovery was announced on July 29, 2005, the same day as Makemake and two days after Haumea, due in part to events that would later lead to controversy about Haumea. The search team had been systematically scanning for large outer Solar System bodies for several years, and had been involved in the discovery of several other large TNOs, including 50000 Quaoar, 90482 Orcus, and 90377 Sedna. Routine observations were taken by the team on October 21, 2003, using the 1.2 m Samuel Oschin Schmidt telescope at Palomar Observatory, California, but the image of Eris was not discovered at that point due to its very slow motion across the sky: The team's automatic image-searching software excluded all objects moving at less than 1.5 arcseconds per hour to reduce the number of false positives returned. When Sedna was discovered in 2003, it was moving at 1.75 arcsec/h, and in light of that the team reanalyzed their old data with a lower limit on the angular motion, sorting through the previously excluded images by eye. 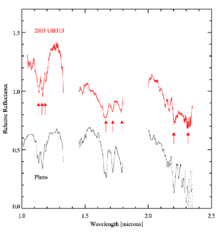 In January 2005, the re-analysis revealed Eris's slow motion against the background stars. Follow-up observations were then carried out to make a preliminary determination of Eris's orbit, which allowed the object's distance to be estimated. The team had planned to delay announcing their discoveries of the bright objects Eris and Makemake until further observations and calculations were complete, but announced them both on July 29 when the discovery of another large TNO they had been tracking, Haumea, was controversially announced on July 27 by a different team in Spain. Precovery images of Eris have been identified back to September 3, 1954. More observations released in October 2005 revealed that Eris has a moon, later named Dysnomia. Observations of Dysnomia's orbit permitted scientists to determine the mass of Eris, which in June 2007 they calculated to be 7022166000000000000♠(1.66±0.02)×1022 kg, 6999270000000000000♠27%±2% greater than Pluto's. Initially, Eris was given a provisional designation, the so called "license plate" name, and then eventually a name based on Greek mythology. Eris is named after the Greek goddess Eris (Greek Ἔρις), a personification of strife and discord. The name was proposed by the Caltech Team on September 6, 2006, and it was assigned on September 13, 2006, following an unusually long period in which the object was known by the provisional designation 2003 UB313, which was granted automatically by the IAU under their naming protocols for minor planets. The regular adjectival form of Eris is Eridian. Due to uncertainty over whether the object would be classified as a planet or a minor planet, because different nomenclature procedures apply to these different classes of objects, the decision on what to name the object had to wait until after the August 24, 2006 IAU ruling. As a result, for a time the object became known to the wider public as Xena. According to science writer Govert Schilling, Brown initially wanted to call the object "Lila", after a concept in Hindu mythology that described the cosmos as the outcome of a game played by Brahman. The name was very similar to "Lilah", the name of Brown's newborn daughter. Brown was mindful of not making his name public before it had been officially accepted. He had done so with Sedna a year previously, and had been heavily criticized. However, no objection was raised to the Sedna name other than the breach of protocol, and no competing names were suggested for Sedna. He listed the address of his personal web page announcing the discovery as /~mbrown/planetlila and in the chaos following the controversy over the discovery of Haumea, forgot to change it. Rather than needlessly anger more of his fellow astronomers, he simply said that the webpage had been named for his daughter and dropped "Lila" from consideration. Brown had also speculated that Persephone, the wife of the god Pluto, would be a good name for the object. The name had been used several times in science fiction, and was popular with the public, having handily won a poll conducted by New Scientist magazine ("Xena", despite only being a nickname, came fourth). This was not possible once the object was classified as a dwarf planet, because there is already an asteroid with that name, 399 Persephone. With the dispute resolved, the discovery team proposed Eris on September 6, 2006. On September 13, 2006 this name was accepted as the official name by the IAU. Brown decided that, because the object had been considered a planet for so long, it deserved a name from Greek or Roman mythology, like the other planets. The asteroids had taken the vast majority of Graeco-Roman names. Eris, whom Brown described as his favorite goddess, had fortunately escaped inclusion. The name in part reflects the discord in the astronomical community caused by the debate over the object's (and Pluto's) classification. Eris is a trans-Neptunian dwarf planet (plutoid). Its orbital characteristics more specifically categorize it as a scattered-disk object (SDO), or a TNO that has been "scattered" from the Kuiper belt into more-distant and unusual orbits following gravitational interactions with Neptune as the Solar System was forming. Although its high orbital inclination is unusual among the known SDOs, theoretical models suggest that objects that were originally near the inner edge of the Kuiper belt were scattered into orbits with higher inclinations than objects from the outer belt. Inner-belt objects are expected to be generally more massive than outer-belt objects, and so astronomers expect to discover more large objects like Eris in high-inclination orbits, which planetary searches have traditionally neglected. Because Eris was initially thought to be larger than Pluto, it was described as the "tenth planet" by NASA and in media reports of its discovery. In response to the uncertainty over its status, and because of ongoing debate over whether Pluto should be classified as a planet, the IAU delegated a group of astronomers to develop a sufficiently precise definition of the term planet to decide the issue. This was announced as the IAU's Definition of a Planet in the Solar System, adopted on 24 August 2006. At this time, both Eris and Pluto were classified as dwarf planets, a category distinct from the new definition of planet. Brown has since stated his approval of this classification. The IAU subsequently added Eris to its Minor Planet Catalogue, designating it (136199) Eris. The orbit of Eris (blue) compared to those of Saturn, Uranus, Neptune, and Pluto (white/gray). The arcs below the ecliptic are plotted in darker colors, and the red dot is the Sun. The diagram on the left is a polar view whereas the diagrams on the right are different views from the ecliptic. Eris has an orbital period of 558 years. Its maximum possible distance from the Sun (aphelion) is 97.65 AU, and its closest (perihelion) is 37.91 AU. It came to perihelion between 1698 and 1699, to aphelion around 1977, and will return to perihelion around 2256 to 2258. When discovered, Eris and its moon were the most distant known objects in the Solar System, apart from long-period comets and space probes. It retained this distinction until the discovery of 2018 VG18 in 2018. As of 2008 there were approximately forty known TNOs, most notably 2006 SQ372, 2000 OO67 and Sedna, that are currently closer to the Sun than Eris even though their semimajor axis is larger than that of Eris (67.8 AU). Eris's orbit is highly eccentric, and brings Eris to within 37.9 AU of the Sun, a typical perihelion for scattered objects. This is within the orbit of Pluto, but still safe from direct interaction with Neptune (29.8–30.4 AU). Pluto, on the other hand, like other plutinos, follows a less inclined and less eccentric orbit and, protected by orbital resonance, can cross Neptune's orbit. Unlike the eight planets, whose orbits all lie roughly in the same plane as the Earth's, Eris's orbit is highly inclined: It is tilted at an angle of about 44 degrees to the ecliptic. In about 800 years, Eris will be closer to the Sun than Pluto for some time (see the graph at the left). As of February 2016[update], Eris has an apparent magnitude of 18.7, making it bright enough to be detectable to some amateur telescopes. A 200-millimeter (7.9 in) telescope with a CCD can detect Eris under favorable conditions. [h] The reason it had not been noticed until now is its steep orbital inclination; searches for large outer Solar System objects tend to concentrate on the ecliptic plane, where most bodies are found. Because of the high inclination of its orbit, Eris only passes through a few constellations of the traditional Zodiac; it is now in the constellation Cetus. It was in Sculptor from 1876 until 1929 and Phoenix from roughly 1840 until 1875. In 2036 it will enter Pisces and stay there until 2065, when it will enter Aries. It will then move into the northern sky, entering Perseus in 2128 and Camelopardalis (where it will reach its northernmost declination) in 2173. In November 2010, Eris was the subject of one of the most distant stellar occultations yet from Earth. Preliminary data from this event cast doubt on previous size estimates. The teams announced their final results from the occultation in October 2011, with an estimated diameter of 7006232600000000000♠2326±12 km. This makes Eris a little smaller than Pluto, which is 7006237200000000000♠2372±4 km across. It also indicates an albedo of 0.96, higher than that of any other large body in the Solar System except Enceladus. It is speculated that the high albedo is due to the surface ices being replenished because of temperature fluctuations as Eris's eccentric orbit takes it closer and farther from the Sun. The mass of Eris can be calculated with much greater precision. Based on the currently accepted value for Dysnomia's period—15.774 days—Eris is 27 percent more massive than Pluto. Using the 2011 occultation results, Eris has a density of 7003252000000000000♠2.52±0.07 g/cm3,[d] substantially denser than Pluto, and thus must be composed largely of rocky materials. Models of internal heating via radioactive decay suggest that Eris could have an internal ocean of liquid water at the mantle–core boundary. In July 2015, after nearly ten years of Eris being considered the ninth-largest object known to directly orbit the sun, close-up imagery from the New Horizons mission more accurately determined Pluto's volume to be slightly larger than Eris's, rather than slightly smaller as previously thought. Eris is now the tenth-largest object known to directly orbit the sun by volume, but remains the ninth-largest by mass. The infrared spectrum of Eris, compared to that of Pluto, shows the marked similarities between the two bodies. Arrows denote methane absorption lines. The discovery team followed up their initial identification of Eris with spectroscopic observations made at the 8 m Gemini North Telescope in Hawaii on January 25, 2005. Infrared light from the object revealed the presence of methane ice, indicating that the surface may be similar to that of Pluto, which at the time was the only TNO known to have surface methane, and of Neptune's moon Triton, which also has methane on its surface. No surface details can be resolved from Earth or its orbit with any instrument currently available. Due to Eris's distant eccentric orbit, its surface temperature is estimated to vary between about 30 and 56 K (−243.2 and −217.2 °C). Unlike the somewhat reddish Pluto and Triton, Eris appears almost white. Pluto's reddish color is thought to be due to deposits of tholins on its surface, and where these deposits darken the surface, the lower albedo leads to higher temperatures and the evaporation of methane deposits. In contrast, Eris is far enough from the Sun that methane can condense onto its surface even where the albedo is low. The condensation of methane uniformly over the surface reduces any albedo contrasts and would cover up any deposits of red tholins. Even though Eris can be up to three times farther from the Sun than Pluto, it approaches close enough that some of the ices on the surface might warm enough to sublime. Because methane is highly volatile, its presence shows either that Eris has always resided in the distant reaches of the Solar System, where it is cold enough for methane ice to persist, or that the celestial body has an internal source of methane to replenish gas that escapes from its atmosphere. This contrasts with observations of another discovered TNO, Haumea, which reveal the presence of water ice but not methane. 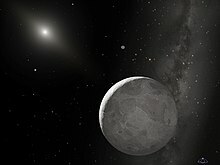 Artist's impression of the dwarf planet Eris and its large moon Dysnomia. This artistic representation is based on observations made at ESO's La Silla Observatory. 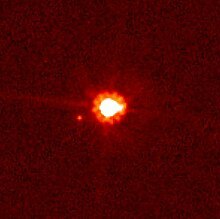 In 2005, the adaptive optics team at the Keck telescopes in Hawaii carried out observations of the four brightest TNOs (Pluto, Makemake, Haumea, and Eris), using the newly commissioned laser guide star adaptive optics system. Images taken on September 10 revealed a moon in orbit around Eris. In keeping with the "Xena" nickname already in use for Eris, Brown's team nicknamed the moon "Gabrielle", after the television warrior princess' sidekick. When Eris received its official name from the IAU, the moon received the name Dysnomia, after the Greek goddess of lawlessness who was Eris's daughter. Brown says he picked it for similarity to his wife's name, Diane. The name also retains an oblique reference to Eris's old informal name Xena, portrayed on TV by Lucy Lawless. In the 2010s, on the heels of the successful Pluto flyby there were multiple studies for follow-on missions to explore the Kuiper belt, and Eris was evaluated among the candidates. It was calculated that a flyby mission to Eris could take 24.66 years using a Jupiter gravity assist, based on launch dates of 3 April 2032 or 7 April 2044. Eris would be 92.03 or 90.19 AU from the Sun when the spacecraft arrives. ^ Images were taken on October 21, 2003. ^  Both are common; the former is the literary pronunciation of the name, but Brown and his students use the latter. ^ Brown is joking on this point. It was in fact the Disney character Pluto that was named after the newly discovered "planet", though Venetia Phair, Pluto's christener, had to counter accusations her whole life that she named the planet after a cartoon dog. ^ "Discovery Circumstances: Numbered Minor Planets". IAU: Minor Planet Center. May 1, 2007. Retrieved May 5, 2007. ^ a b c d e f g h Brown, Mike (2006). "The discovery of 2003 UB313 Eris, the largest known dwarf planet". Retrieved May 3, 2007. ^ a b c "JPL Small-Body Database Browser: 136199 Eris (2003 UB313)" (September 18, 2014 last obs). Retrieved November 23, 2014. ^ a b "List Of Centaurs and Scattered-Disk Objects". Minor Planet Center. Retrieved September 10, 2008. ^ a b Buie, Marc (November 6, 2007). "Orbit Fit and Astrometric record for 136199". Deep Ecliptic Survey. Retrieved December 8, 2007. ^ "Define Eris". Dictionary.com. Random House. Retrieved October 4, 2012. ^ "Julia Sweeney and Michael E. Brown". Hammer Conversations: KCET podcast. 2007. Archived from the original on October 6, 2008. Retrieved October 1, 2008. ^ a b c d e f g Sicardy, B.; Ortiz, J. L.; Assafin, M.; Jehin, E.; Maury, A.; Lellouch, E.; Gil-Hutton, R.; Braga-Ribas, F.; Colas, F.; Widemann (2011). "Size, density, albedo and atmosphere limit of dwarf planet Eris from a stellar occultation" (PDF). European Planetary Science Congress Abstracts. 6: 137. Bibcode:2011epsc.conf..137S. Retrieved September 14, 2011. ^ a b c Beatty, Kelly (November 2010). "Former 'tenth planet' may be smaller than Pluto". NewScientist.com. Sky and Telescope. Retrieved October 17, 2011. ^ a b c d Brown, Michael E.; Schaller, Emily L. (June 15, 2007). "The Mass of Dwarf Planet Eris" (PDF). Science. 316 (5831): 1585. Bibcode:2007Sci...316.1585B. doi:10.1126/science.1139415. PMID 17569855. ^ a b Johnston, Wm. Robert (September 20, 2014). "(136199) Eris and Dysnomia". Johnston's Archive. Retrieved September 27, 2015. ^ a b c d e "AstDys (136199) Eris Ephemerides". Department of Mathematics, University of Pisa, Italy. Retrieved February 28, 2016. ^ "Conversion of Absolute Magnitude to Diameter". sfasu.edu. Archived from the original on March 23, 2010. ^ Bertoldi, F.; Altenhoff, W.; Weiss, A.; Menten, K. M.; Thum, C. (February 2, 2006). "The trans-Neptunian object UB313 is larger than Pluto". Nature. 439 (7076): 563–564. Bibcode:2006Natur.439..563B. doi:10.1038/nature04494. PMID 16452973. ^ "Dwarf Planet Outweighs Pluto". space.com. 2007. Retrieved June 14, 2007. ^ "How Big Is Pluto? New Horizons Settles Decades-Long Debate". www.nasa.gov. 2015. Retrieved July 14, 2015. ^ "The IAU draft definition of "planet" and "plutons"" (Press release). IAU. August 16, 2006. Archived from the original on August 20, 2006. Retrieved August 16, 2006. ^ Brown, Mike (2010). "The shadowy hand of Eris". Mike Brown's Planets. Retrieved November 7, 2010. ^ "How Big Is Pluto? New Horizons Settles Decades-Long Debate". NASA. 2015. Retrieved July 13, 2015. ^ Thomas H. Maugh II; John Johnson Jr. (October 16, 2005). "His Stellar Discovery Is Eclipsed". Los Angeles Times. Retrieved July 14, 2008. ^ Blue, Jennifer (September 14, 2006). "2003 UB 313 named Eris". USGS Astrogeology Research Program. Archived from the original on October 18, 2006. Retrieved January 3, 2007. ^ Brown, Mike. "New Planet". web.gps.caltech.edu. ^ "International Astronomical Association homepage". Archived from the original on September 30, 2007. Retrieved January 5, 2007. ^ a b Green, Daniel W. E. (September 13, 2006). "(134340) Pluto, (136199) Eris, and (136199) Eris I (Dysnomia)" (PDF). IAU Circular. 8747. Archived from the original on February 5, 2007. Retrieved January 12, 2012. ^ "The girl who named a planet". BBC News. January 13, 2006. Retrieved June 21, 2007. ^ "Xena and Gabrielle" (PDF). Status. January 2006. Retrieved May 3, 2007. ^ Mike Brown (2012). How I Killed Pluto and Why It Had It Coming. Spiegel & Grau. p. 159. ^ a b Brown, Mike (2007). "Lowell Lectures in Astronomy". WGBH. Archived from the original on July 16, 2008. Retrieved July 13, 2008. ^ "Mpc 52733" (PDF). Minor Planet Center. 2004. Retrieved August 30, 2010. ^ Schilling, Govert (2008). The Hunt For Planet X. Springer. p. 214. ISBN 978-0-387-77804-4. ^ "Planet X Marks the Spot" (PDF). TechRepublic. 2006. Retrieved July 13, 2008. ^ O'Neill, Sean (2005). "Your top 10 names for the tenth planet". NewScientist. Retrieved June 28, 2008. ^ "The Discovery of Eris, the Largest Known Dwarf Planet". California Institute of Technology, Department of Geological Sciences. Retrieved January 5, 2007. ^ "IAU0605: IAU Names Dwarf Planet Eris". International Astronomical Union News. September 14, 2006. Archived from the original on January 4, 2007. Retrieved January 5, 2007. ^ "Pluto Now Called a Plutoid". Space.com. June 11, 2008. Retrieved June 11, 2008. ^ Gomes R. S.; Gallardo T.; Fernández J. A.; Brunini A. (2005). "On the origin of the High-Perihelion Scattered Disk: the role of the Kozai mechanism and mean motion resonances". Celestial Mechanics and Dynamical Astronomy. 91 (1–2): 109–129. Bibcode:2005CeMDA..91..109G. doi:10.1007/s10569-004-4623-y. ^ "NASA-Funded Scientists Discover Tenth Planet". Jet Propulsion Laboratory. 2005. Retrieved May 3, 2007. ^ "IAU 2006 General Assembly: Resolutions 5 and 6" (PDF). IAU. August 24, 2006. Archived from the original (PDF) on September 28, 2006. ^ Robert Roy Britt (2006). "Pluto Demoted: No Longer a Planet in Highly Controversial Definition". space.com. Archived from the original on August 20, 2011. Retrieved May 3, 2007. ^ a b c d Yeomans, Donald K. "Horizons Online Ephemeris System". California Institute of Technology, Jet Propulsion Laboratory. Retrieved January 5, 2007. ^ Peat, Chris. "Spacecraft escaping the Solar System". Heavens-Above. Retrieved January 25, 2008. ^ "Discovered: The Most-Distant Solar System Object Ever Observed". Carnegie Science. Retrieved December 18, 2018. The second-most-distant observed Solar System object is Eris, at about 96 AU. ^ "Hubble Finds 'Tenth Planet' Slightly Larger Than Pluto". NASA. April 11, 2006. Retrieved August 29, 2008. ^ John Stansberry; Will Grundy; Mike Brown; John Spencer; David Trilling; Dale Cruikshank; Jean-Luc Margot (2007). "Physical Properties of Kuiper Belt and Centaur Objects: Constraints from Spitzer Space Telescope". arXiv:astro-ph/0702538. ^ M. E. Brown; E.L. Schaller; H.G. Roe; D. L. Rabinowitz; C. A. Trujillo (2006). "Direct measurement of the size of 2003 UB313 from the Hubble Space Telescope" (PDF). The Astrophysical Journal. 643 (2): L61–L63. arXiv:astro-ph/0604245. Bibcode:2006ApJ...643L..61B. doi:10.1086/504843. ^ Brown, Mike (2007). "Dysnomia, the moon of Eris". Caltech. Retrieved June 14, 2007. ^ Hussmann, Hauke; Sohl, Frank; Spohn, Tilman (November 2006). "Subsurface oceans and deep interiors of medium-sized outer planet satellites and large trans-neptunian objects" (PDF). Icarus. 185 (1): 258–273. Bibcode:2006Icar..185..258H. doi:10.1016/j.icarus.2006.06.005. ^ "New Horizons Probe Finds Out Pluto's Bigger (and Icier) Than We Thought". NBC News. July 13, 2015. Retrieved July 13, 2015. ^ M. E. Brown; C. A. Trujillo; D. L. Rabinowitz (2005). "Discovery of a Planetary-sized Object in the Scattered Kuiper Belt". The Astrophysical Journal. 635 (1): L97–L100. arXiv:astro-ph/0508633. Bibcode:2005ApJ...635L..97B. doi:10.1086/499336. ^ J. Licandro; W. M. Grundy; N. Pinilla-Alonso; P. Leisy (2006). "Visible spectroscopy of 2003 UB313: evidence for N2 ice on the surface of the largest TNO" (PDF). Astronomy and Astrophysics. 458 (1): L5–L8. arXiv:astro-ph/0608044. Bibcode:2006A&A...458L...5L. doi:10.1051/0004-6361:20066028. ^ "Faraway Eris is Pluto's Twin". ESO Science Release. October 26, 2011. Retrieved October 28, 2011. ^ Brown, M. E.; Van Dam, M. A.; Bouchez, A. H.; Le Mignant, D.; Campbell, R. D.; Chin, J. C. Y.; Conrad, A.; Hartman, S. K.; Johansson, E. M.; Lafon, R. E.; Rabinowitz, D. L. Rabinowitz; Stomski, P. J., Jr.; Summers, D. M.; Trujillo, C. A.; Wizinowich, P. L. (2006). "Satellites of the Largest Kuiper Belt Objects" (PDF). The Astrophysical Journal. 639 (1): L43–L46. arXiv:astro-ph/0510029. Bibcode:2006ApJ...639L..43B. doi:10.1086/501524. Retrieved October 19, 2011. ^ Tytell, David (2006). "All Hail Eris and Dysnomia". Sky and Telescope. Retrieved January 5, 2010. ^ "SwRI team makes breakthroughs studying Pluto orbiter mission - Astrobiology Magazine". Astrobiology Magazine. October 25, 2018. Retrieved October 27, 2018. Wikimedia Commons has media related to 136199 Eris.